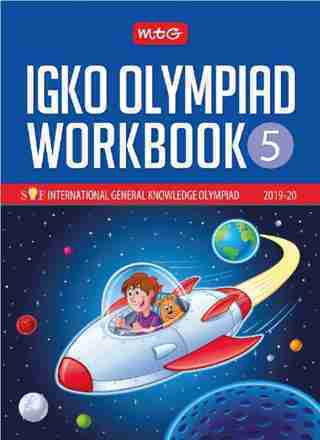 Product description: International General Knowledge Olympiad (IGKO) Workbook -Class 5 is written by Raghav singh and published by Mtg learning media pvt ltd. Buy International General Knowledge Olympiad (IGKO) Workbook -Class 5 by Raghav singh from markmybook.com. An online bokstore for all kind of fiction, non fiction books and novels of English, Hindi & other Indian Languages. International General Knowledge Olympiad (IGKO) Workbooks are designed to familiarize students with the type of questions coming in GK Olympiad exams. The Workbook contains chapter-wise multiple choice question bank, followed by answers in the end of the book. Current affair topic is added in the end to cover every possible topic. OMR sheet similar to main exam is also given in the end of the book for the OMR sheet filling practice of students. Questions asked in every topic are vivid and covers a vast area of knowledge to give every information Class wise. Attractive visual images in questions helps in fast grasping and registering the facts in mind. It gives complete question practice and quick recap with self-analysis for great performance in the Olympiads.